Since 1996, CNet Training has educated thousands of Service Leavers, providing them with the skills, hands-on experience and sought after qualifications to enter the lucrative network cable industry. Introducing the Certified Network Cable Installer (CNCI®) program, it’s the industry endorsed program that provides everything you need to start a new lucrative career within the network infrastructure industry. 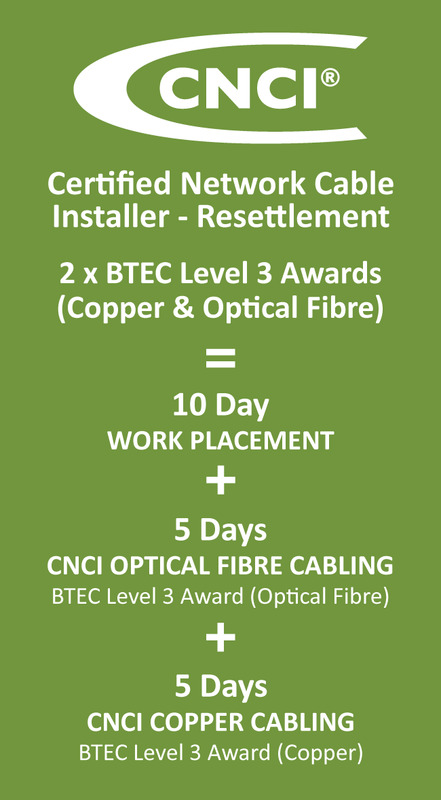 The CNCI® is dedicated to providing cable installers with everything they need to confidently and accurately prepare, install, test and certify copper and fibre cabling systems, specifically for those wishing to demonstrate the highest levels of knowledge, skills and expertise in network infrastructure. Eligibility for an Electrotechnical Certification Scheme (ECS) Datacomms Specialist card – required to allow you to carry out work on-site. Download full program details here. Selecting where to spend your resettlement grant is a big step. The CNet Training team understand this and will help every step of the way as make this important decision. That’s why we always have someone on hand to speak with to help ensure that you make the right decision. When you speak with us there’s no obligation and no pressure selling. CNet Training is proud that its programs and The Global Digital Infrastructure Education Framework form the benchmark for the industry across the world. We believe it’s the combination of our expert instructors teaching the very latest technical knowledge, standards and codes of practice, along with our internationally recognised qualifications that form the secret of our on-going success. Every CNet Training program has been carefully designed to blend technical knowledge with essential hands-on skills that are needed for the industry today. We have an on-going schedule to regularly review the content of each program to ensure it reflects the very latest changes in technology, in addition to preparing learners for possible new and emerging industry trends that are just around the corner. For those more experienced, CNet Training has many other Network Infrastructure and Data Centre education programs, please see The Global Digital Infrastructure Education Framework that shows career progression routes with programs that in line with industry requirements. Royal School of Signals Adopts the CNCI® – The leaders in IT and Communications in the Digital Age for the British Army, the Royal Corps of Signals, have entered a collaborative agreement with CNet Training to internally deliver the Certified Network Cable Installer (CNCI®) program – read the full story here. Read more about the impact of CNCI® within the Industry.